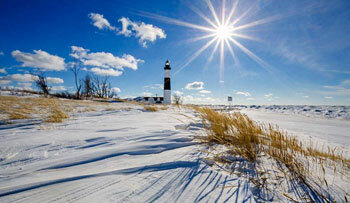 There's a winter wonderland awaiting you once the snow covers the ground at the Ludington State Park. Dressed in winter white, the scenic natural beauty at the park becomes even more pristine and peaceful. The park remains open year-round for hiking and snowshoeing, plus there are scheduled activities and events to give those who love winter something fun to look forward to! A Michigan State Park Recreation Passport is required to enter the park and may be purchased at the park. Residents may also now purchase the $10 Recreation Passport when they renew their Michigan license plate at the Secretary of State office or through the Michigan e-store at www.michigan.gov/estore. The Ludington State Park is offering free guided snowshoe walks on Saturdays in January and February from 2-3:30pm, weather permitting--so think snow! These one and a half hour guided programs will take you past some of the most beautiful State Park scenery, through woods and snow-covered sand dunes. The All walks begin and end at the Warming Shelter, located next to the parking lot at the park's entrance. 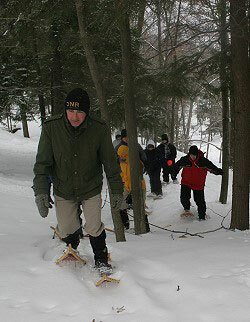 The park loans out 40 pairs of snowshoes on a first-come, first-served basis, and all walks are free. Instructors will guide you through the steps to making top-of-the-line traditional wooden snowshoes that will get you through the deep snowfalls, and will last for generations. The cost for making a pair of snowshoes is $220. This includes the pre-formed wooden frames, lacing, top of the line binding, and personal instructions. Classes are held in December and January. Call the Ludington State Park for reservations at (231) 843-9261.